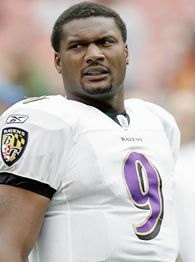 After 13 years of greatness, Steve McNair hangs up the cleats! He was the last active player that was originally with the Houston Oilers. He was a one time MVP of the league and two time pro bowler. Who should be the Raven quarterback now? ~ by Rod on April 18, 2008. He was about to fall down anyway! The Ravens should pick a QB in the draft. Probably Brian Brohm or John David Booty. This entry was posted on April 18, 2008 at 11:59 am and is filed under NFL Update, Players.You can follow any responses to this entry through the RSS 2.0 feed.You can leave a response, or trackback from your own site.